Egypt Temples Activity - HISTORY'S HISTORIESYou are history. We are the future. The ancient Egyptians were blessed. They loved their families and their Pharaoh. They loved their life along the Nile. They loved their gods. To show their love for their gods they built great temples to honor them, magnificent structures that have stood for thousands of years. For your lesson on Egyptian religion you created an Egyptian god or goddess all your own. Today, you will show your love for the Egyptian god or goddess you created by designing an Egyptian temple to honor them. View the slide show below for inspiration. 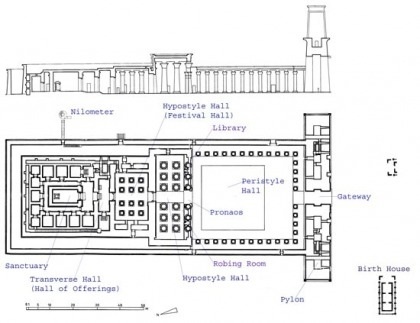 Complete some independent research on "Egyptian temple design" and "Egyptian temple layout." Create a floorplan for your new temple. Draw one "side elevation" that clearly corresponds to your floorplan. Lastly, pretend that you are to present your plans to the Pharaoh as part of a design competition. To do so, write a 3 minute speech that helps the Pharaoh imagine what your temple will look like upon completion. Use your words to take the Pharaoh on a detailed virtual tour of what you hope will be the winning design for her latest building project.